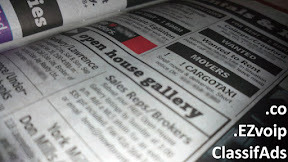 Classifieds for EZvoip.co's clients. We will post your ads in Kijiji and Craigslist and we'll even put up posters with your ad downtown, with free optional call, text and email forwarding! This is a service provided by EZvoip.co to its wonderful customers. All sales advertised here are private sales by private individuals who take full responsibility for their items. EZvoip.co simply facilitates advertising and responding to ads, in an effort to save our existing VoIP (phone services) customers time. We all have items we occasionally want to get rid of. For example, a smartphone purchased just last year is no longer as hot as we once thought it was and we want to buy a new one. The old one still holds some value and it's worth selling so that the impact of the new purchase is less dramatic. Yet the selling process is extremely tedious and time consuming, which is why we often end up keeping both the new and the old one. And this is where EZvoip.co can help! Simply complete the form and we will not only generate a page here, but we'll also advertise on Kijiji and Craigslist (if you are selling in USA and Canada). We will also automatically renew the ads and help you deal with fraud and/or redundant inquiries. Additionally, we might put up some posters in select areas of the city - this is a feature we have yet to fully arrange. If you are a customer outside USA and Canada, we might be able to post the ads in local classifieds as well - make sure you suggest where! We gain by helping our customers and by getting some exposure ourselves in the process. It's a win-win-Win-WIN! You may also submit the answers via email to classifads@ezvoip.co, but please keep in mind that email ad submissions may not be processed in a timely manner or at all. We will then generate and publish your page and / or your poster and you can update the video or photo album description with the short link to the page. Congratulations, your item is half-sold! Now sit back and wait for people to contact you! A project of EZvoip.co, where talk is both cheapo and EZ. Try our services for free!